Why should you come to Belgium? Because it is the best kept secret in Europe. Visiting medieval cities, quaint towns, gothic cathedrals and town halls, castles and carillons will keep you busy during the day. At night go to a pub, there are more than 350 delicious beers to chose from. The reputation of our gourmet food makes the French jealous and it is almost impossible to find chocolates as good as ours! There are more castles per square mile in Belgium than anywhere else in the world. Beautiful castles to experience, formal gardens to get lost in, peaceful abbeys and historic battlefields are awaiting your visit. 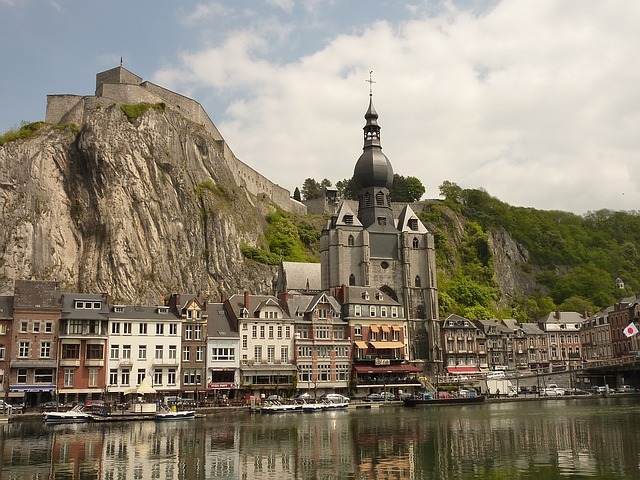 We would like to suggest a few special sites for your historic journey through French speaking Wallonia and Brussels. The Grand Place in Brussels is simply one of the most beautiful city squares in the entire world. Nothing can adequately prepare you for the first time you lay eyes on it, and you’ll likely find yourself wanting to return time and again. Often the site of events and festivals, Brussels’s main square is lively almost anytime. Its Christmas Market is something to behold in the winter. When it comes to Belgian tourist attractions, the Grand Place is one of the best, hands down. There are a bunch of great festivals and events that take place throughout the year in Belgium, but few can rival the tradition and exuberance of the Carnival of Binche. Every February on the three days leading up to Lent, the town of Binche puts on its world-famous carnival, which is included on the UNESCO World Heritage list. It’s hard to sum up the experience of the Binche Carnival in Belgium. Should you be traveling to Belgium during the festival, consider adding it to your itinerary. All over Belgium, shops, factories, and museums that are dedicated to chocolate are in good supply, and you will be glad to know that many chocolate connoisseurs consider Belgium chocolate to be the best in the world. You can safely put chocolate tours on the list of things to do in Belgium, and the best part comes when you get to sample some of the product. Even if you don’t take a chocolate tour, enjoying a healthy amount of chocolate in Belgium is always a good idea. Of all the Belgian tourist attractions, Mini Europe, or Mini Europa as it is called in Belgium, is one of the more unique. You will find some of the most recognizable European monuments and landmarks at Mini Europe, though they are just one-twenty-fifth the size of the originals. See shrunken versions of the Tower of Pisa, Montmartre, and the aforementioned Grand Place in Brussels, for example, not to mention a list of other tantalizing structures. There’s even a bubbling model of Mount Vesuvius. Well worth the price of admission, Mini Europe is one of the Belgium attractions that you won’t forget anytime soon. Belgium’s history has always been linked to both commercial and cultural exchange, and much of its character is due to its role as the great meeting place of western Europe. Traces of the Austrians, Spanish, French and Dutch can still be seen in its architecture and in the lifestyle of its people. Today, its capital city of Brussels is one of the world’s great cosmopolitan cities, home to both the European Union and NATO, as well as a wealth of international trade and finance companies. Somehow, Belgium has maintained a low-key approach to all of this international sophistication. It is a country for connoisseurs, but connoisseurs who do not take themselves too seriously. Because the Belgians certainly do not. Belgium has a temperate, maritime climate predominantly influenced by air masses from the Atlantic. Rapid and frequent alternation of different air masses separated by fronts gives Belgium considerable variability in weather. In the coastal region, the climate is mild and humid, on the seacoast there are a few hot days, here the annual rainfall is the lowest in the country. There are marked temperature changes farther inland. In the high southeasterly districts, hot summers alternate with very cold winters. Good season usually from April until October and snow likely during winter months. The average annual temperature is 8°C; in Brussels, the mean temperature is 10°C, ranging from 3°C in January to 18°C in July. Frontal conditions moving from the west produce heavy and frequent rainfall, average annual rainfall is between 700 and 1000 mm. Winters are damp and cool with frequent fogs; summers are rather mild. Regional climatic differences are determined by elevation and distance inland. Farther inland, maritime influences become weaker, and the climate becomes more continental, characterized by greater seasonal extremes of temperature. The Ardennes region, the highest and farthest inland, is the coldest. In winter, frost occurs on about 120 days, snow falls on 30 to 35 days, and January mean minimum temperatures are lower than elsewhere. Because of the topography, the Ardennes region has the highest rainfall in Belgium. In contrast, the Flanders region enjoys generally higher temperatures throughout the year. Belgium average rain fall is 852 mm a year. Whether you do your antique shopping in the stylish Brussels Sablon area, browsing through exquisite items or by flashlight early on Sunday morning at the flea market, the hunt in Belgium can be as entertaining as the purchase. Belgium has been an important center of the art world for centuries. Choose from museum-quality stores in major cities to antique markets in smaller towns. Belgium offers an incredible wealth of antiques, Art Deco objects, old books, fine crystals or just plain interesting artifacts. There is something for every taste and budget. Valid Passport. Nationals of EU-member states and of some other states only need an official identification card. US and Canadian citizens need a valid passport. A visa is not required for stays of less than 90 days. Other nationalities should check with the Belgian Embassy or nearest Consulate Office for visa requirements. 220 volts, 50Hz. European-style two-pin plugs can be used.